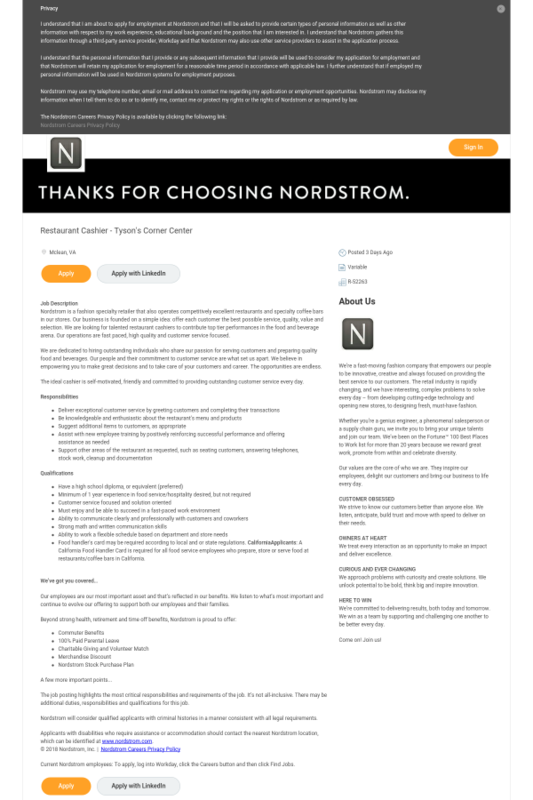 Nordstrom is a fashion specialty retailer that also operates competitively excellent restaurants and specialty coffee bars in our stores. Our business is founded on a simple idea: offer each customer the best possible service, quality, value and selection. We are looking for talented restaurant cashiers to contribute top tier performances in the food and beverage arena. Our operations are fast paced, high quality and customer service focused. We are dedicated to hiring outstanding individuals who share our passion for serving customers and preparing quality food and beverages. Our people and their commitment to customer service are what set us apart. We believe in empowering you to make great decisions and to take care of your customers and career. The opportunities are endless. The ideal cashier is self-motivated, friendly and committed to providing outstanding customer service every day. Food handler's card may be required according to local and or state regulations. CaliforniaApplicants: A California Food Handler Card is required for all food service employees who prepare, store or serve food at restaurants/coffee bars in California.